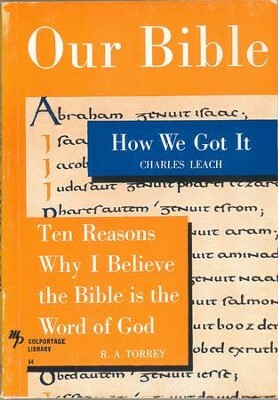 Dr. Leach answers these pertinent questions: Is the Bible really true? Where did the Bible come from? Has our Bible suffered change through the years? When were the books of the New Testament collected? Did Christ use our Old Testament? Dr. Leach first discusses the New Testament, then the Old, and finally traces the history of our English Bible. Dr. R.A. Torrey concludes with ten reasons given to prove that the Bible is the Word of God. I'm the author/artist and I want to review Our Bible: How We Got It and Ten Reasons Why I Believe the Bible is the Word of God / Digital original - eBook.